Mark Hertsgaard • 339 pp. Houghton Mifflin Harcourt, 2012. You’d think — okay, I’d think — that there’s little new to write on the subject of global warming. To anybody who can read a scientific study, the human role in burning things that make carbon dioxide is clear enough. Likewise, the trajectory of rising temperatures and sea levels is clear and accelerating. But Mark Hertsgaard, a veteran environmental reporter who lives in California, pivots the focus from slowing greenhouse-gas pollution to the need to adapt and respond to changes wrought by the steady accumulation in heat-trapping gases. We have just endured the warmest decade in history, and the Intergovernmental Panel on Climate Change says temperatures could rise 5° C by 2100. If that happens, “The Earth would be hotter than at any time in the past 50 million years,” Hertsgaard writes. Sea level is a rising concern in the near future, and Hertsgaard contrasts New Orleans, flooded and ruined by Hurricane Katrina in 2005, with the Netherlands, which is largely below sea level. The record of injustice, corruption and incompetence in New Orleans augurs poorly for the difficult task of restraining the sea, while the Dutch have resolved to survive as a nation and are building massive sea defenses based on communitarian principles. If some land cannot be saved, those who must sacrifice for the common good are compensated without being allowed to block measures needed for national survival. 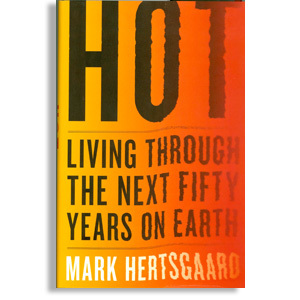 The time for discussion is past, Hertsgaard says, and given the momentum in the climate system, he argues that we must prepare now for inevitable warming and flooding. That action should not just benefit rich people in the rich countries that have created the lion’s share of global warming pollutants, Hertsgaard says. He visits poor, low-lying Bangladesh, threatened by typhoons and floods and observes that a father in Bangladesh loves his daughter just as much as a father in California.